Simcox will challenge John McCain in a Senate primary. 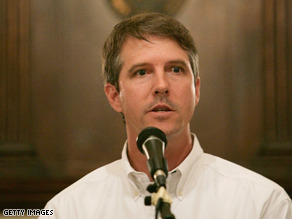 (CNN) - Arizona Sen. John McCain - whose support of illegal immigration reform nearly derailed his presidential bid two years ago - will face a Senate primary challenge next year from Minuteman founder Chris Simcox. Simcox, who has resigned from the volunteer organization with the mission of preventing illegal crossings of the U.S. border, will formally announce his Senate bid on Wednesday. "John McCain has failed miserably in his duty to secure this nation's borders and protect the people of Arizona from the escalating violence and lawlessness," Simcox said in a statement. "He has fought real efforts over the years at every turn, opting to hold our nation's border security hostage to his amnesty schemes." "Coupled with his votes for reckless bailout spending and big government solutions to our nation's problems, John McCain is out of touch with everyday Arizonans. Enough is enough," he added. McCain's presidential hopes were nearly dashed after teaming up with Massachusetts Sen. Ted Kennedy on the Comprehensive Immigration Reform Act of 2007, a measure that provided a path to citizenship for illegal immigrants currently residing in the United States. McCain later backtracked from calling for a path to citizenship and, at a CNN debate in January 2008, said he would not have voted for the legislation if it reached the Senate floor. "No, I would not, because we know what the situation is today," he said of voting for the bill he sponsored. "The people want the borders secured first." A week before Monday's Homeland Security field hearing on border security in Phoenix, Arizona, McCain criticized the Obama administration's plan for immigration reform. He said he could not support the plan, which he said "does not adequately address either securing the border or a legal temporary worker program." "We need to act on the pressing issue of border security now, and then seek comprehensive immigration legislation that includes a temporary worker program," McCain said in a statement April 14. "Any legislation that does not address these two key components is not real reform." McCain did not face a primary challenger in 2004 and won reelection with over 75 percent of the vote. Here's your chance Arizona. . .time to retire one Senator John McCain. John, we thank you for your many (many) years of service, but it's time for a new voice. The comments he made about 'targeted' veterans were written by wingnuts, for wingnuts, specifically for wingnuts in his state who could vote for this wingnut challenger in the Republican primary. The people convinced that the report is targeted at them are either a) correct because they are a member of right wing terrorist organization bent on violent overthrow of the government, or b) are obsessively paranoid multiple gun owners who are incapable of listening to anything that doesn't reinforce their pre-existing world view. Either way, the Republicans are playng with fire. They are courting people who don't listen to reason, and are convinced that the Other is out to get them. Loose lips empty ammo clips. Lived in Arizona and visit every three months, John McCain hasn't done a darn thing for Arizona but get rich. It's hard to believe Arizona has kept McCain as their Senator, what a joke. who cares? The immirgations issues are beyond both of these guys moral understanding. I do not like John McCain's politics though I respect his service to his country. Take a good look at the photo that you have posted here of Mr. Simcox . Does he have that far away look? Does he look angry? Does he seem to be starry eyed? I am not from Arizona and I will not be voting but for those who will I would take a much closer look at Mr. Simcox. This photo is a look you see in people who may have pyschiatric issues. Don't believe me ask the professionals. If anyone is familiar with the Hamptons on the east end of Long Island, he/she should know that unemployed day laborers who used to be able to make a living when times were brighter are now forced to squat in vacant lands in close proximity to some of the ritziest properties. Most of them are illegal aliens. Arizona is not alone. The entire country needs to address this situation once and for all. Best of luck to Chris Simcox.. it is time for Mc Cain to retire. We need someone who knows what is going on and provide solid solutions to the many challenges facing the country not constant criticizing the Obama administration's plan for immigration reform. It appears that the just say "NO" GOPs do not have any real soultions or plans to help solve the many financial, housing, energry, healthcare, education, global warming, unemployment, problems facing so many Americans today. I am listening daily to hear a viable solution/plan to any of the listed concerns/problem every day from the Republicans party, but instead we only hear the same old failed concepts (lower taxes, smaller government, no regulations of the banks, insurance compaines, auto industry, healthcare, free markets, etc.) Oh by the way let not do a darn thing and lets the United States continue off the cliff, it is okay if we have another Great Deprerssion. After, all if we Republicans and Democrats and Independents do nothing to help get the country back on the right track, then so what nothing will be done. We will always have President Obama to blame and say that he did not do anything to prevent or help to turn the country around. We the GOPs Party of jsut say "No" do want to see our country to succeed we want failure of President Obama and the United States! You know what, he won't win but he's right about the dire need to secure the border. If you haven't been to Southern Arizona, you can't understand how weak our border security really is and how easily illegal aliens can come and go as they please. I am listening daily to hear a viable solution/plan to any of the listed concerns/problem every day from the Republicans party, but instead we only hear the same old failed concepts (lower taxes, smaller government, no regulations of the banks, insurance compaines, auto industry, healthcare, free markets, etc.) Oh by the way let not do a darn thing and lets the United States continue off the cliff, it is okay if we have another Great Deprerssion. After, all if we Republicans and Democrats and Independents do nothing to help get the country back on the right track, then so what nothing will be done. We will always have President Obama to blame and say that he did not do anything to prevent or help to turn the country around. We the GOPs Party of jsut say "No" do not want to see our country to succeed we want failure of President Obama and the United States! Well, at least McCain has a challenger for his senate seat. This guy's gotta be better than McCain. Wow I hope he wins mccain is too old and needs to retire. "McCain did not face a primary challenger in 2004 and won reelection with over 75 percent of the vote." Wait, are you saying that he didn't have a rival until after primaries were over, or that he ran unopposed and still managed to lose nearly 25% of the votes? McCain, stay out of the way of the research, efforts and announcements by the Department of Homeland Security. If they have identified attempts to recruit veterans then there must be some validity to it and we must be vigilant. This does not vilify our honorable veterans. Rather it identifies their vulnerabilities given the circumstances they face. They deserve our full attention and support. No, the opposite you say? Then think about what happened when Bush ignored memos regarding 9/11. Good. Please run that old republican liberal out of Office!